-Andrea was born and raised in the county she loves, Yorkshire. -After leaving school at 16, Andrea got a job in Greggs and worked her way up through a diverse career, including Saturday assistant, Senior Management, Music Tutor in three secondary schools, and running her own business. She was even a retail story manager at our local shopping centre- The White Rose. -Further roles included; International Business Development Manager for an executive management training company in which she was solely responsible for increasing sales penetration in Europe and Asia through developing client relations in both the public and private sectors. 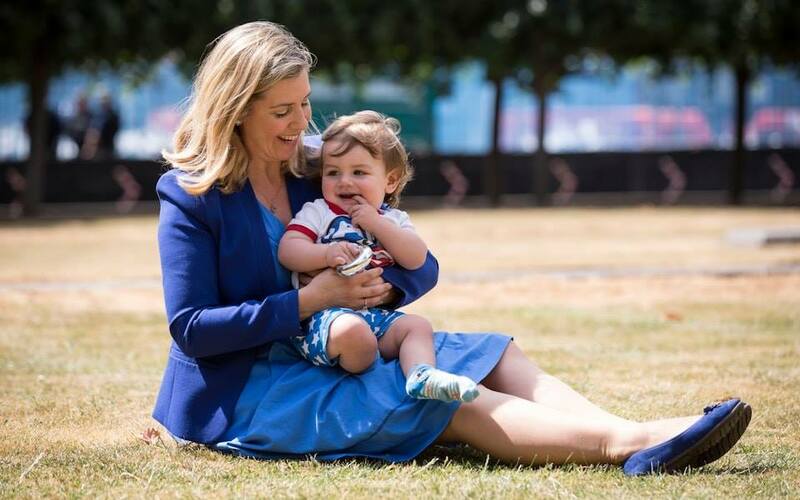 -She is now married to fellow Conservative MP, Jack, and together they have a young son, Clifford George, who was born on Wednesday 29th of March 2017. As an active proponent and the MP coordinator in Yorkshire for the Vote Leave campaign, Andrea was thrilled that her boy's birthday shared the date with the official triggering of Article 50. Andrea enjoys little more than spending time with her son Clifford, who is now almost walking! -Clifford is named after Andrea's late and beloved father, whose tragic death in 2011 from the hospital superbug MRSA following a routine operation at a local hospital pushed Andrea into politics. Following the loss of her father, Andrea became a Trustee and the Regional Representative (Voluntary) for the charity MRSA Action UK and has been campaigning for better patient care for many years. -Andrea is a soprano singer and songwriter and has always used her music as a way in which to fundraise for charities including; Macmillan, Wish upon a Star, Help for Heroes, Home Start, Save The Children, the Army Benevolent Fund and the Doris Banham Dog Charity. -Andrea has a compassionate nature, with a desire to protect the most vulnerable and also animals. As an animal lover, Andrea has long been a vegetarian and supporter of animal rights. Andrea's Mini Schnauzers, Lady and Godiva, won top prize in the Westminster Dog of the Year show 2015. Lady has since passed away, however Andrea still has Godiva who often joins her on the campaign trail! -Andrea was elected as the Member of Parliament for Morley and Outwood in May 2015, famously beating the then Shadow Chancellor, Ed Balls, by 422 votes. At the last general election, she increased her vote share by 11.8%, raising her majority to 2,104 votes. -As the Member of Parliament for Morley and Outwood, Andrea spends some of the week representing residents in Westminster, and the rest back home in Yorkshire where she regularly holds rotating surgeries across the constituency to discuss issues with constituents, holds regular events such as jobs fairs and memory cafes, and attends local events. -In the last Parliament Andrea sat on the Health Select Committee, and currently sits on the Committee for Exiting the EU. As front bench politicians will no doubt now know, Andrea is an upfront, direct, straight talking and strong Yorkshire woman who passionately stands up for her constituents and what she believes in. Andrea has highlighted five key issues that are her focus for Morley and Outwood going forward. Andrea has been a passionate Brexiteer for years. As far back as 2014, Andrea was working on the 'Let Britain Decide' campaign, which advocated for the British people to have the final say on their membership of the EU through a referendum. Local residents share her belief, and in 2016 voted to leave the EU by 60%. Andrea is committed to standing up for the referendum result and ensuring the Government respects the will of the British people to leave the EU in full. Andrea welcomes the Government's work on mental health, and locally has taken the initiative. Andrea works with carers and the Alzheimer's society to host regular Memory Cafes across the constituency. She has also hosted mental heath round tables and is working to improve access to counselling in schools. Andrea is keen to improve transport across Morley and Outwood. She has launched a pothole patrol hotline (07383339411) for residents to report potholes on. Additionally, she has worked with the Government to secure more funding for our train stations. Andrea is committed to helping residents hold local authorities to account, getting the local councils to put more police on patrol across Morley and Outwood and guarantee waste collections. Andrea stands with residents against the Council's housing plans. She is working with residents action groups to stop unsuitable developments on our green spaces.